THE MODERATOR: Questions for Tim Thomas. Q. Tim, throughout your whole career you’ve had to prove yourself time and time again. Do you think you’ve done that now? TIM THOMAS: For now. I know the game, and I know the way that it is, you know. Winning the Stanley Cup is huge. It’s the biggest accomplishment of my career thus far. But everybody knows in this game that you have to continuously prove yourself. I’m sure if I were to, for example, start out the season bad next year that I probably, with the Cup, would have bought myself a little bit of leeway, but it won’t last forever unless I turn my game around. Q. I know you talked earlier in the series about visualization, when you were in some soggy locker room in the some of the Nordic countries, did you visualize yourself here? TIM THOMAS: No. At that time I was probably just visualizing each game one at a time when I was in Finland. I didn’t want to think about the NHL because it seemed like it was so far away. But having said that, I was happy playing where I was playing. I was playing in a very good league and I had a lot of good friends over there. I’m very happy that I made the decision to come back. It was a tough decision at the time, but it paid off in the long run in this case. Having said that I would have been happy playing my whole career over there if the need would have been. That didn’t make any sense (laughter). Q. Tim, what’s going through your head after Patrice Bergeron’s goal and how did that go with each passing goal? TIM THOMAS: I was hoping someone else would score so I wouldn’t have to shut ’em out. I was happy going into the game, talked about not getting too high. If we do score, you can’t act like you’ve won the Stanley Cup because you will get an emotional high and it will end up showing on the ice. I was just trying to stay level. It was just one goal. It was a huge goal, the game-winning goal, but at that time, there was still a lot of game and a lot of work left to do. Q. Tim, do you have a message for the fans who have been waiting for a long time for this? TIM THOMAS: You’ve been waiting a long time, but you got it. You wanted it, you got it. We’re bringing it home. Q. Tim, goaltending is about streaks and confidence. Was there ever a point in this Final that you were worried about losing a little bit of momentum? TIM THOMAS: Yeah, to be completely honest with you, Game 6 at home. Right off the opening face-off there was a guy that whacked it backhand from the outside blue line right off the opening face-off and I just lost it. It was up in the air and I went into full panic mode in my mind. Then Vancouver put the pressure on and whizzed the puck around the crease four or five different times, shot just wide. And I was on my heels there for a second, and that was the first time that I’d gotten nervous during the finals. So, yeah, I was scared. I won’t lie. I had nerves yesterday and today. I faked it as well as I could, and I faked my way all the way to the Stanley Cup. Q. Can you talk about the changing of the guard with the Bruins. Obviously Mark Recchi’s last game and the monster game from Brad Marchand, Tyler Seguin’s contribution, the past and the future of the team here? PATRICE BERGERON: Obviously, I talked to Recchi last night and I was feeling nervous and I asked him to give me some advice. He told me to relax and go out there and play the game and to do it for him. Obviously it could be his last game and I’ve learned so much from him on and off the ice, it’s a great feeling that we’ve accomplished this as a team. You’re right, the future looks bright with all the guys that we have, but to be honest with you, I’m worrying about the celebration right now. Q. Patrice, on the first goal, can you just walk me through that? I don’t think that pass was intended for you, was it? PATRICE BERGERON: I’m not sure, but I was ready for it. And Recchi tried to shoot, and obviously it was perfect because I was ready as well behind him. We sort of surprised ’em. That first goal was huge. Q. You cut it pretty close, didn’t you? PATRICE BERGERON: Well, post and in, you can’t ask for anything better, can you? TIM THOMAS: He does it all the time in practice (laughter). Q. Tim, such a great old classic trophy is yours. What does it feel like to win that? 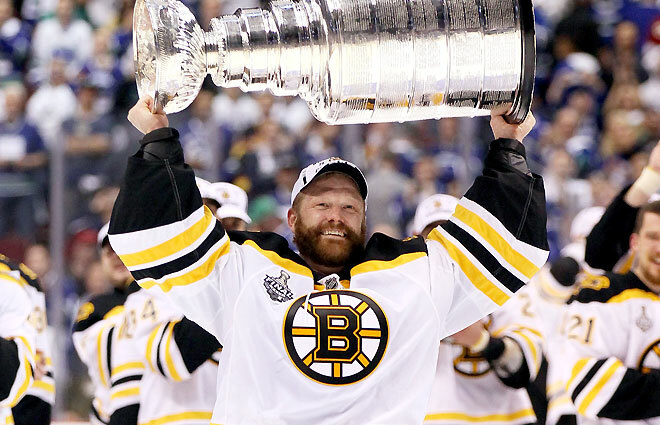 TIM THOMAS: The Conn Smythe? It’s quite an honor. The Stanley Cup is the biggest one. That’s the one that you’re shooting for. Conn Smythe is completely an honor. I just sat down here and started to read some of the names on it and it’s an honor to be mentioned in the same Maple leaf. Patrick, Ron Hextall, Ken Dryden, those are the three goalies that I can see on this side facing me, it’s amazing. Q. Claude, we have to start with who is the special guest of honor? from Boston to watch us win the Stanley Cup. COACH JULIEN: Five and a half. dominated. That’s the sign of a great goaltender. proud of him and obviously the rest of the team. things would take care of themselves. They did. You know, we came out Game 4 and played a strong game at home, also. wanted to win it for themselves, but even more so for him. about was going out there and earning it. It wasn’t ours to have, it was ours to earn. satisfaction do you take in this? you got to stay the course. Today you’re rewarded for it. you don’t like the players. know that I appreciate you trying to help me through that. personal. It was about making them better people and better players. that you had had here? and they had to accomplish that. all, that you’ve been able to fulfill your wish to give back to the fans? stand here and you’re happy about what you gave people on the outside. and for the fans in Boston. willing to stand back and just watch them, and that will make my day. their eyes, as you mentioned. share in this at the end? obviously when you’ve got a concussion, flying can be sometimes touchy. their rings in, put pictures up and decorated the room. They took charge. THE MODERATOR: Thank you, Coach, and Katryna. This entry was posted in Advertisements, NHL and tagged bergeron, bettman, boston, bruins, canucks, chara, cup final, hockey, horton, Inside Sports, julien, luongo, recchi, stanley cup, tim thomas. Bookmark the permalink.